Born in Beaufort, SC, with roots in the Washington, DC area, and a 1995 graduate of Herndon High School, Herndon, VA, Captain Garrett Lawton joined the Marine Corps in June 1996 and was commissioned a Second Lieutenant in the Marine Corps in 1999 after graduating from the Platoon Leader’s Course at West Virginia University with dual degrees in mechanical and aerospace engineering. Capt. Lawton, call sign “Tubes,” joined MARSOC in 2007 and served as Hotel Company Air Officer and Operations Officer. While on patrol in Herat Province, Afghanistan on August 4, 2008 with Hotel Company, 2nd MSOB, the patrol encountered an improvised explosive device and Capt. Lawton was killed as a result of the explosion. Capt. 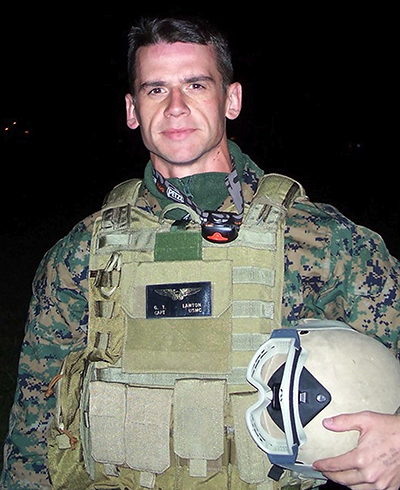 Lawton’s personal awards include a Bronze Star with combat V (posthumously) and a gold star in lieu of second award, two Purple Hearts, Air Medal with numeral 7, two Navy-Marine Corps Achievement Medals, and two Combat Action Ribbons.